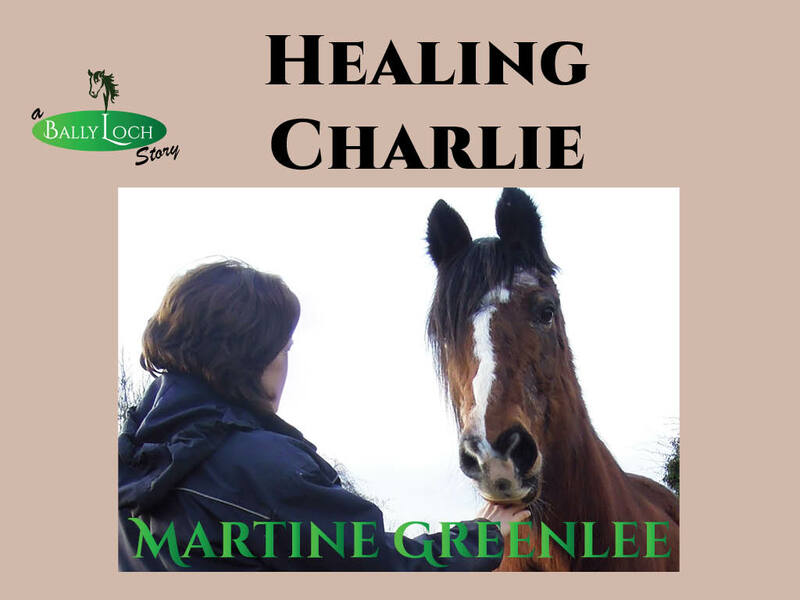 Earlier this week, I trekked part of the way down to Reillanne with MC as she returned home with Quieto. We have two new companions, Sam and Zingara. Zingara (it means Gypsy) is a four year old who was recently broken by Alexandrine. Sam is keeping her at the farm for a while, as they get to know each other. Zingara is a Merens crossed with a Spanish breed (I’m not sure which one). She seems like a sharp little thing, but she’s going great for a newly broken four year old and didn’t put a foot wrong on our trek. 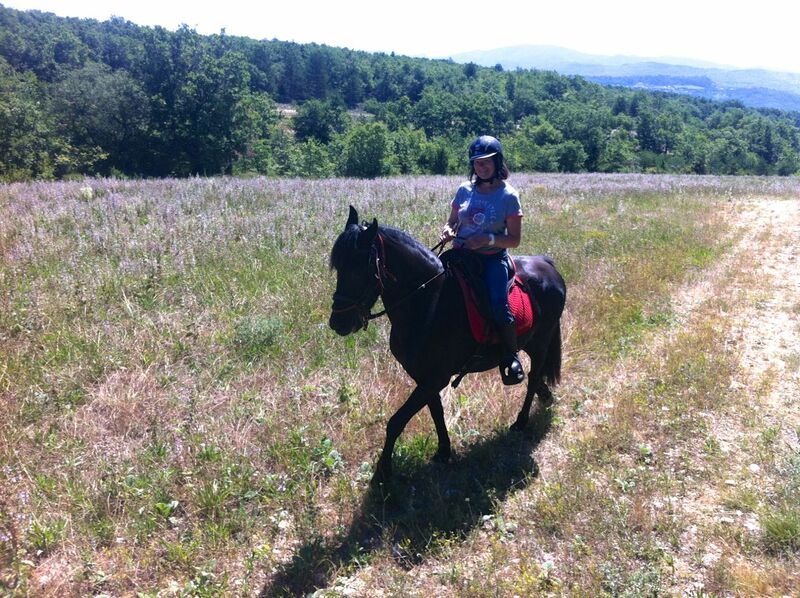 After years and years of riding Western, Sam is loving all the new stuff she’s learning. 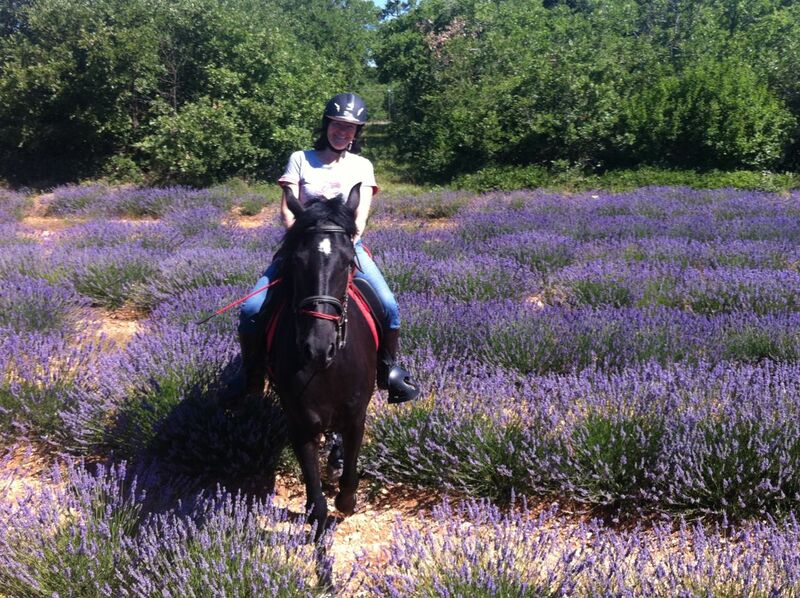 She’s been doing a lot of Equifeel and she’s starting to learn some dressage – English riding! – so she’s ready to take on some competitions in the Autumn. Another member for Team Alexandrine! 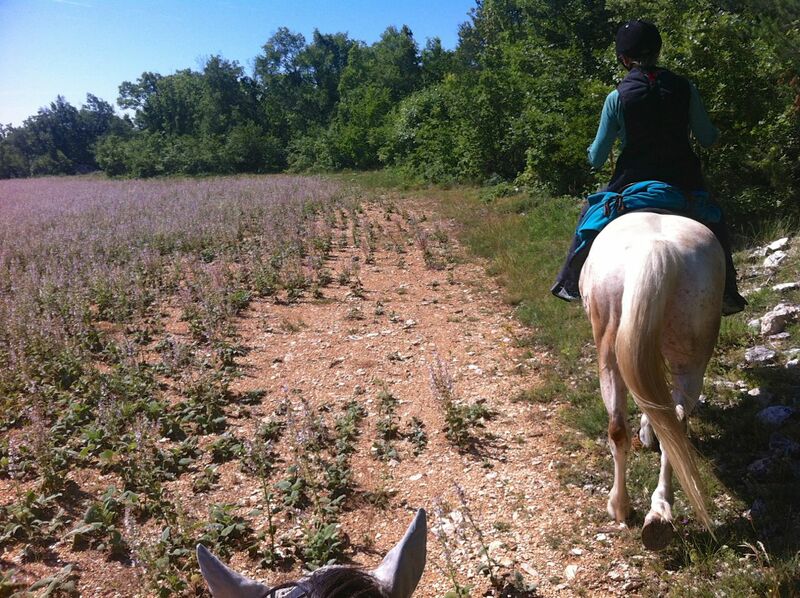 This particular trek goes through the fields where Georges is growing crops for essential oils, Clary Sage and Lavandin. Sam hadn’t gone this way before and she was blown away by it. 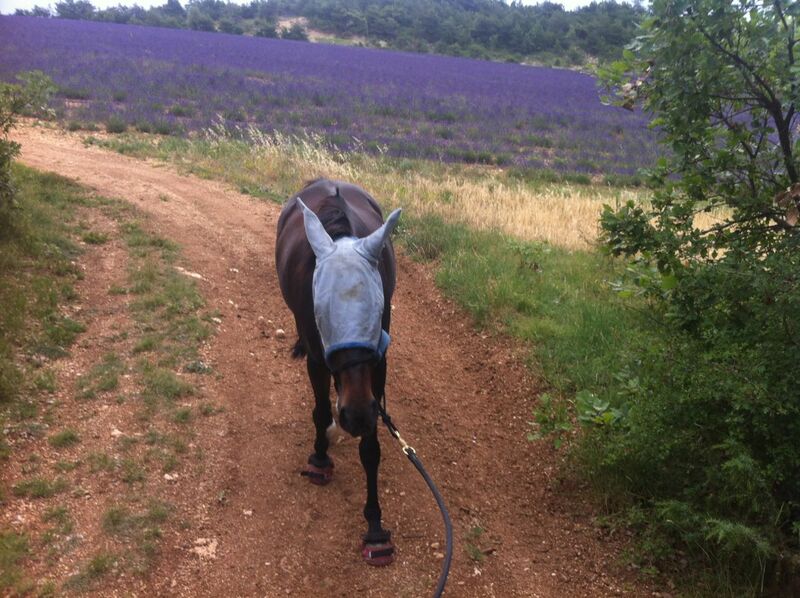 Even for the locals, there’s something special about riding through the lavender fields. Sam was horrified. Wouldn’t the owner be cross? she asked. Well yeah, but the owner is Georges, MC’s husband, so we hope we’ll get away with it! …and paused for a “Through the Ears” photo. MC turned off a while later and Sam and I continued our loop, returning home through a different Field of Clear Thinking. It was a really lovely ride. The weather has been really good, ie. not too hot. There’s been quite a lot of wind which has the twin benefits of cooling us down and keeping the horseflies at bay. Feckin’ brilliant. Two horses exercised in under an hour. Why haven’t I done this before? I wasn’t sure whether to leave his fly mask on or off. After consulting with Alexandrine, I went for “on”. I thought it would be best if he wasn’t likely to be driven demented by those damn ear-flies. Next time, I’ll just use a fly bonnet. It’s weird not being able to see his eyes. Lovely! I would have been worried about crushing the crop too–but…sounds like you were in the clear. John “ponies” the girls on occasion. The last time, though, all hell broke loose and Ruffy got free. Had to jump off Harley who thought it was “off to the races time” so I could snag Ruffy’s lead. Hope your 2 are better behaved! 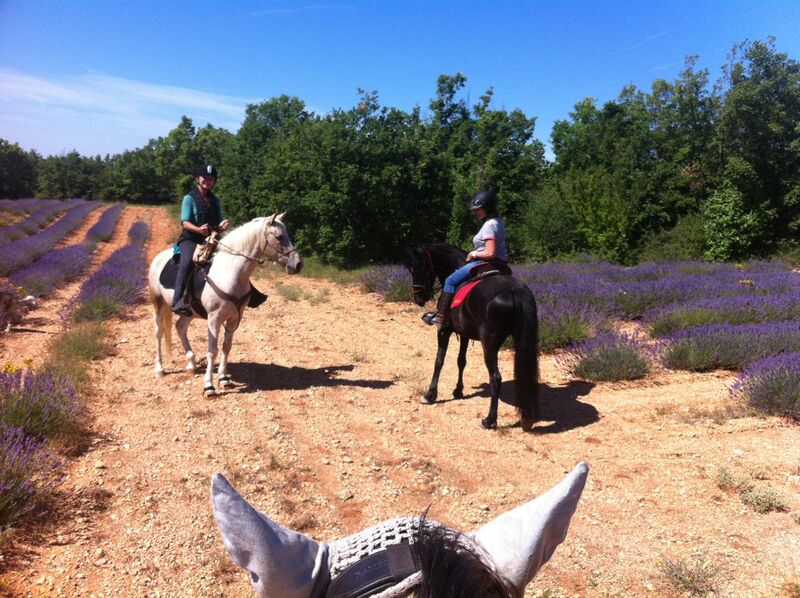 Riding in a sea of lavender looks so dreamy, what a great trek!! 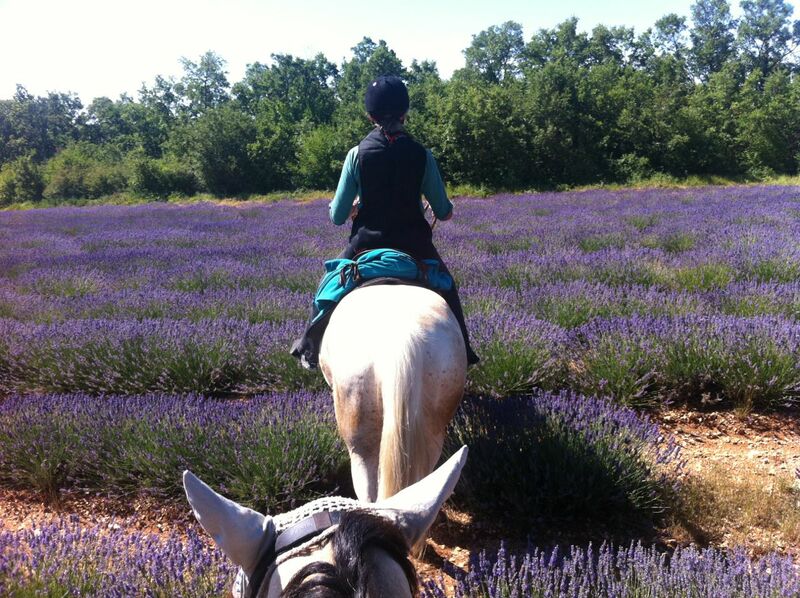 Ahhhh-the scent of warm horses and lavender-what could be better? 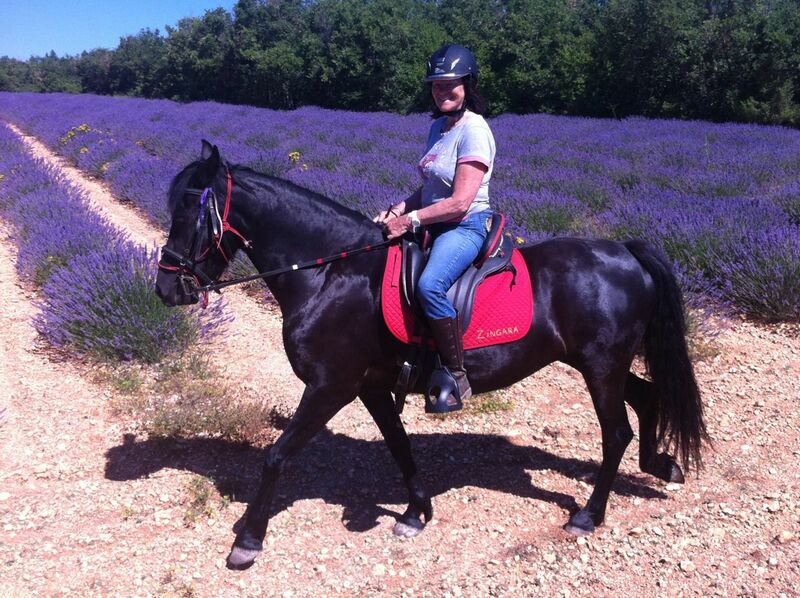 By the way, what brand is that saddle???? It looks like a treeless saddle?? 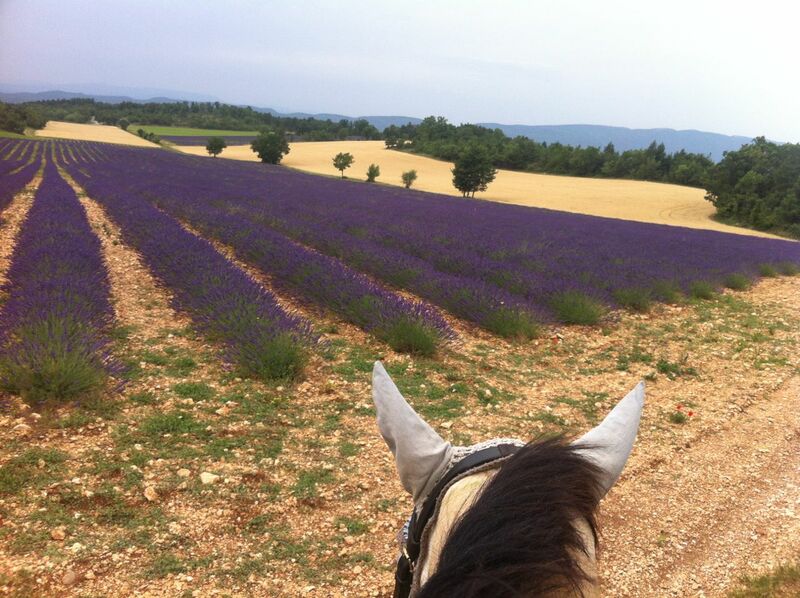 Lovely photos — a beautiful combo, horses and lavender..